SAFE International™, a global organization that offers world-leading self-defense and personal-protection instruction, is hosting an instructor certification program in Ottawa from March 9 – 11, 2018 at Plyomax Fitness, 3771 Spratt Road, Ottawa, ON. Ottawa, Ontario, Canada, January 05, 2018 — SAFE International™, a global organization that offers world-leading self-defense and personal-protection instruction, is hosting an instructor certification program in Ottawa from March 9 – 11, 2018 at Plyomax Fitness, 3771 Spratt Road, Ottawa, ON. As part of the organization’s mission to empower 500,000 women and girls in self-defense by 2020, the instructor certification program aims to spread the reach of life-saving safety information and physical skills from a curriculum designed to reach some of society’s most vulnerable to violence in often limited time. SAFE International’s self-defense curriculum has been honed, tested, and proven effective over the course of more than twenty years. It is currently taught by experts in security and personal protection, reaches leaders in public safety around the world, and is delivered regularly to teens, women and youth in a framework that promotes responsible citizenship and teaches survival skills that are effective no matter someone’s age or size. The instructor certification program will be led by founder Chris Roberts and instructor Richard Dimitri, a world leader in personal protection and security training. With skills and expertise amassed over two lifetimes in the professional realm of self-defense and violence prevention, Roberts and Dimitri team up to deliver this program with passion and purpose. Their mission is fueled by evidence-backed information, personal and professional experiences with real-world violence. “A lot of people believe that self-defense training and martial arts are similar. They’re not. When it comes to violence there are psycho-social influences and behavioural elements that exist in uncontrolled environments with many variables that simply don’t apply when people are sparring on the mat or in the ring where rules exist. To effectively deliver self-defense training these dynamics need to be addressed, dissected and explored long before physical training is introduced,” says Roberts. SAFE International™ believes anyone who is interested will benefit from the instructor certification program and registration is open to anyone interested in attending. Previous certification has included a range of attendees from martial artists, workplace safety and violence prevention coordinators, fitness instructors, parents, teachers, and others interested in learning and passing on credible information about staying safe. For more information, or to register, visit www.safeinternational.biz. SAFE International™ was launched by Chris Roberts in 1994 and has since reached more than 200,000 people around the world with world-class safety and self-defense instruction. The organization is based in Canada and operates throughout North America, Europe and Australia. Each year, SAFE International™ reaches more than 10,000 teens, women and youth with life-saving information and skills. Toronto, ON, Canada, February 22, 2017 – SAFE International™ proudly offers a self-defense certification course for those interested in serving their community or workplace as a self-defense instructor. Led by CEO and founder Christopher Roberts and Founder of Senshido International Richard Dimitri, this mobile self-defense instruction company has more than 25 years of self-protection coaching and training for ages 12 to 82. They have established SAFE International™ as Canada’s leader in the self-defense industry and are expanding their reputation across the border to the United States, Australia and Finland. Since 1994, SAFE International™ has taught more than a quarter million people, reaching more students at schools, business associates and corporations every year. With a message that can save lives, SAFE International™ wants to spread these valuable lessons by certifying future instructors to join the cause. In a matter of five hours, instructors can equip a group of individuals in the fundamentals of self-defense, protecting themselves and those around them. As an instructor, physical combative skills are taught that are based on human physiology and anatomy, not martial arts. Our teaching model is founded on the premise that when facing a real-life threat, one must act spontaneously. Instructors also teach their trainees the necessity of remaining mentally alert and exhibit situational awareness, no matter the setting. To ensure this, our training involves simulations of potential real-life scenarios to embed and establish the right attitude of response as second nature in our clients. Our SAFE International™ clients leave with a well-rounded education, possessing both the needed theoretical and the hands-on understanding, thanks to our knowledgeable trainers. The SAFE International™ certification course is holistic and comprehensive, covering the basics of personal protection, as well as taking into consideration the legal, ethical, moral and psychological applications. This self-defense certification is applicable to all demographics, encompassing law enforcement personnel to middle school students to corporate businesspersons. Training modules cover actual real-life experiences, not only making the training applicable, but also memorable. At SAFE International™, our curriculum is based on thousands of hours of experience, training and decades of research into criminology, behavioral psychology and violence and confrontation physiology. Those who were once deemed as vulnerable and weak are now equipped with the knowledge to deescalate scenarios and react to confrontation. Our trainers must have the leadership skill set to provide diverse and customized training courses to effectively reach each group of trainees. SAFE International™ has put together several teaching modules, varying in levels of specific certification in order to give our instructors options and maintain affordability. Whether one is a novice or are experienced, the first module, SAFE International’s Core Curriculum, extensively covers the core fundamentals of the SAFE International™ self defense program, building a foundation for future certifications. In fact, the SAFE Core curriculum certification material is revised and updated every year – a consistent practice for the past 23 years – in an effort to maintain up-to-date information so as to corroborate with current reports of civilian violence. Upon graduation, instructors will receive their official SAFE International™ certification, as well as marketing tools such as official SAFE International™ badges and banners. Our goal is to prepare our instructors scattered abroad so they have all the tools necessary to teach clients effectively. SAFE International™, a mobile self-defense business with certified partners in Canada, the US, and Australia, has developed a Self-Defense “Train the Trainer” program for First Nations to equip their communities with the training, knowledge, and information to protect themselves from violent victimization. Lunenburg, ON, April 15, 2016 – SAFE International™, a mobile self-defense business with certified partners in Canada, the US, and Australia, has developed a Self-Defense “Train the Trainer” program for First Nations to equip their communities with the training, knowledge, and information to protect themselves from violent victimization. Since Aboriginal people are unfortunately twice as likely to experience assault, sexual assault, or robbery in their lifetime, SAFE International™ created a specific self defense certification that can be learned and implemented in the community to help people feel safer. “Aboriginal people are almost twice as likely to be the victim of spousal violence as non-Aboriginals,” said Christopher Roberts, Founder and Instructor at SAFE International™. “Even worse, the homicide rate for an Aboriginal individual was almost seven-times higher than that of non-Aboriginals. At SAFE International™, it’s our goal to curb these alarming statistics and equip the community leaders with the training they need to protect their youth, teens, and adults. The First Nations Self-Defense Classes are not Martial Arts programs, nor are they designed with complex techniques that take months to perfect. The self defense training focuses on the awareness and avoidance component of unexpected assault rather than just the physical part of self-defense. The ultimate goal is to train the Aboriginal people in identifying, avoiding, and removing themselves from situations that could turn violent. SAFE International intends to change the alarming statistics and ensure all Aboriginal people are free from harm. Our self defense “Train the Trainer” courses are currently available for communities in Canada and the United States. Lunenburg, ON, April 10, 2016 – SAFE International™, a mobile self-defense business with certified partners in Canada, the US, and Australia, is offering a Self-Defense Certification for all interested individuals looking to not only improve their safety, but also bring the self-protection process to their communities. Unlike other Self-Defense Certifications, SAFE’s is designed to translate the self-defense process into an easy to apply business prospect for interested applicants. 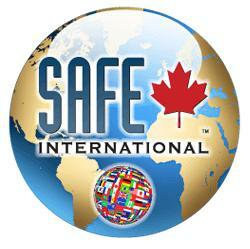 SAFE International™ is the leading provider of mobile self-defense/personal protection training in Ottawa, Canada. Ottawa, ON, December 23, 2014 (via Straight Line PR) — SAFE International ™ is the leading provider of mobile self-defense/personal protection training in Ottawa, Canada. SAFE International has taught more than 190,000 clients in the private, corporate and high school environments since 1994. SAFE International self defense Ottawa is expanding its seminar options to include women’s self defense parties in Ottawa, ON. SAFE International quickly realized that women had completely different concerns, fears, and needs than males. Chris Roberts, Managing Director of SAFE International listened to their concerns and tailored something that was not only educational, but also met their personal fears. Men have no idea what women go through on an everyday basis from the stares and comments to the physical gestures and advances. One of the reasons that SAFE International enjoys teaching women’s self defense Ottawa, is how receptive women are to the skills that the SAFE International instructors provide. SAFE International teaches self defense concepts, rather than techniques. This allows women to learn in a much shorter time. SAFE International always covers Awareness and Avoidance strategies which are based on one’s daily routines. We examine what an attacker looks for, what an attacker wants and doesn’t want in confrontation. One of the biggest topics we explore is how most people are too polite, even when their intuition is telling them the complete opposite. We cover the most common distraction techniques an attacker will use to gain an advantage. We then move on to verbal strategies in the event that avoidance is no longer possible. Rather than just teaching to yell at a potential attacker, we cover a few verbal strategies based on the aggressor and the scenario. The third step is addressing the physical aspect of Ottawa women’s self defense. We begin with the advantages of adopting a passive stance rather than an aggressive stance. We only teach gross motor strikes due to the adrenal rush one gets when they are in a highly stressful state such as an attack scenario. We teach a philosophy of “Attack the Attacker” which reverses one from being the Prey, to that of being the Predator. Another philosophy is to attack the head if all avoidance and verbal strategies have failed. This is only 30 minutes into the physical training and you can see how the self-defense concepts are very effective. The self defense drills increase with intensity as the participants gain more confidence. This is very important, as you don’t want to terrify your clients right from the start. It is important to build rapport with your students and the results will be seen as the drills progress. The following YouTube video shows how much can be learned in only 30 minutes of women’s self defense instruction. Invite 6 to 8 of your friends for a few hours of fun, education and potentially life- saving instruction. Plan a meal, bbq, snacks, maybe some dessert! Be prepared for a unique Ottawa Women’s Self Defense experience! What has made SAFE International so popular is their unique method of teaching with humour and sharing of anecdotes. Get to experience their simulated attacks in scenario specific situations such as at the front door, the kitchen, the car, etc. The owners of SAFE International™ have announced they are launching a self defense program which is tailored specifically to the needs of real estate agents. The real estate profession carries with it many potential safety risks, from meeting new prospective clients to conducting open houses and showings. Lisbon, WI, November 02, 2014 – SAFE International™, which has been in the forefront since 1994 empowering people to save their own lives through the use of self-defense concepts, believes its current focus on empowering people to protecting themselves is needed now more than ever with recent violent events in the real estate profession. “Unfortunately, we live in an increasingly violent society, and we, here at SAFE International™, want to not only share our knowledge and experience with others, but while in the process of sharing we are also empowering people throughout Canada, the United States, and globally to defend themselves,” said Christopher Roberts, Managing Director of SAFE International™. Even though their mission at SAFE International™ is to teach real self-defense skills to as many women, children, and men, from 12 years of age to 82 years of age, SAFE International™ does offer corporate self defense courses to those in working environments that are considered higher risk. Just some of the topics that are addressed during a 2 or 4 hour Real Estate Safety seminar are distraction techniques used on real estate agents, car safety, safety in the home, dangers of letting income rule over intuition, how attackers choose their victims, importance of body language, the good and bad of cell phones, plus much more! “What sets our approach to self-defense training apart from all other programs is how we present our courses with real-life simulated scenarios, with hands-on techniques and with humour, yes… humour,” added Roberts, who believes that while the subject matter is a very serious one, SAFE International™ knows that learning in a safe, fun, and enthusiastic environment is the best way to retain what is being presented. The owners of SAFE International have announced they are launching a self defense program which is tailored specifically to the needs of real estate agents. Ingleside, ON, October 12, 2014 – The real estate profession carries with it many potential safety risks, from meeting new prospective clients to conducting open houses and showings. SAFE International, which has been in the forefront since 1994 empowering people to save their own lives through the use of self-defense concpets, believes its current focus on empowering people to protecting themselves is needed now more than ever with recent violent events in the real estate profession. “Unfortunately, we live in an increasingly violent society, and we, here at SAFE International, want to not only want to share our knowledge and experience with others, but while in the process of sharing we are also empowering people throughout Canada, the United States, and globally to defend themselves,” added Roberts. Even though their mission at SAFE International is to teach real self-defense skills to as many women, children, and men, from 12 years of age to 82 years of age, SAFE International does offer corporate self defense courses to those in working environments that are considered higher risk. Just some of the topics that are addressed during a 2 or 4 hour Toronto Real Estate Safety seminar are distraction techniques used on real estate agents, car safety, safety in the home, dangers of letting income rule over intuition, how attackers choose their victims, importance of body language, the good and bad of cell phones, plus much more! “What sets our approach to self-defense training apart from all other programs is how we present our courses with real-life simulated scenarios, with hands-on techniques and with humour, yes… humour,” said Roberts, who believes that while the subject matter is a very serious one, SAFE International™ knows that learning in a safe, fun, and enthusiastic environment is the best way to retain what is being presented. The owners of SAFE International have announced they are well on its way towards realizing their mission by launching Self Defense Fort McMurray. Fort McMurray, Alberta, October 09, 2014 – (Straight Line PR) – The owners of SAFE International have announced they are well on its way towards realizing their mission by launching Self Defense Fort McMurray. They are aiming to accomplish this feat through the offering of their self-defense training seminars, which will include women’s self-defense parties, high school self defense, and corporate lunch and learns. SAFE International, which has been in the forefront since 1994 empowering people to save their own lives through the use of self-defense concepts, believes its current focus on empowering women to protecting themselves is needed now more than ever. “Unfortunately, we live in an increasingly violent society, and we, here at SAFE International, want to not only want to share our knowledge and experience with others, but while in the process of sharing we are also empowering people throughout Canada, the United States, and globally to defend themselves,” added Roberts. Adding SAFE International self defense in Fort McMurray is another step in that journey. Even though their mission at SAFE International is to teach real self-defense skills to as many women, children, and men, from 12 years of age to 82 years of age, they are focusing their attention primarily on civilians who really need these skills. While continuing to meet the growing needs of people, corporations, organizations and schools year after year, SAFE International™ has continuously provided both effective, and highly memorable, personal protection instruction through their unique ability to reach more people in a way that enables them to retain and utilize the skills if necessary. “While others in the self-defense industry focus solely on the physical side of personal protection, we here at SAFE International™ focuses on all aspects. Our training, for example, covers the most important awareness and avoidance phases, to intelligent verbal strategies, and to the physical aspects you may require to enable yourself get home safely to your family,” explained Roberts, who has had the great fortune of collaborating with professionals and specialists from all fields within the realm of self defense. “There is violence everywhere, and everyone is responsible for their personal security, and it s on that basis that SAFE teaches self-defense that addresses real-life violence, thus providing a no-nonsense approach to personal safety. Our goal is to teach our students to Recognize, React, and Respond effectively to any confrontation in the quickest possible time,” concluded Roberts. Ottawa Self Defense, SAFE International Self Defense Experts are now offering Ottawa Knife Self Defense Courses in Ottawa and all throughout the province. Ottawa, ON, October 02, 2014 – (Straight Line PR) – Ottawa Self Defense, SAFE International Self Defense Experts are now offering Ottawa Knife Self Defense Courses in Ottawa and all throughout the province. 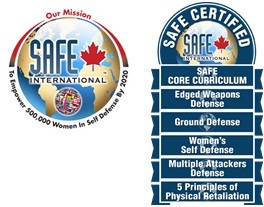 SAFE International is the leading provider of mobile self defense training in Ottawa, Canada and has expanded internationally with a goal to teach 500,000 people by 2020! SAFE International is now offering knife defense Ottawa in private or small group instruction settings which can be taught at your location. * Realistic pressure training of knife attacks to give someone a realistic experience of a knife attack. If you would like to find out more information about knife defense in Ottawa or anywhere in Ontario, you can visit their main site by going to www.safeinternational.biz You may also contact SAFE International by email at info@safeinternational.biz or call them toll free at 1-800-465-5972.